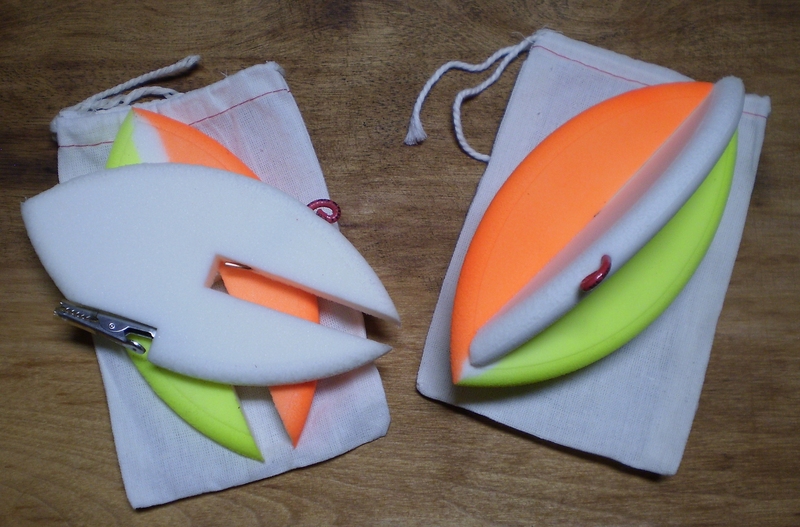 DualFins weigh 1 ounce are 6" long, use SURF BOARD action to keep them riding high and can be flipped to either side of the boat at any time without reeling in! MUSKY VIDEO - With Steve Pennaz the host of North American Fishing Club TV drift fishing and trolling with DualFin planers gets out of the side to get more Musky! There are many reasons to use the DualFin! The DualFin uses SURF BOARD action to keep them riding high with two high visibility colors. The DualFin can be switched to either side of the boat at any time without reeling in. The DualFin has no sharp corners or brackets sticking out. Its football shape is practically tangle proof. The DualFin is made of a high density memory foam that is as tough as rawhide! You can bend it in half and it returns to shape! The DualFin only releases when a fish pulls but easy to reel in without releasing. The DualFin can be used in fresh or saltwater. The DualFin can be cast for river fishing or walking the shore line. The DualFin has a sensitive line release, yet keeps the lure or bait connected until a fish strikes. The DualFin can handle fairly big lures at speeds up to 5 mph. The DualFin is USER FRIENDLY with the quickest and simplest rigging method. The DualFin has ON-DEMAND DIRECTION CONTROL and can get in tight to shore where fish are spawning or hiding. It is one thing to troll and another thing to excite fish with a 180 degree direction change that looks like a bait fish in distress. They are 100% made in the USA.